The easiest way to invest in real estate is investing in real estate mutual funds. As part of portfolio diversification, real estate fund can provide additional dividend income to investor. 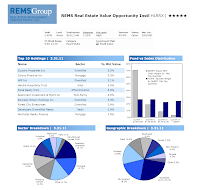 One of the top real estate mutual funds is REMS Real Estate Value Opportunity. The fund review is below. 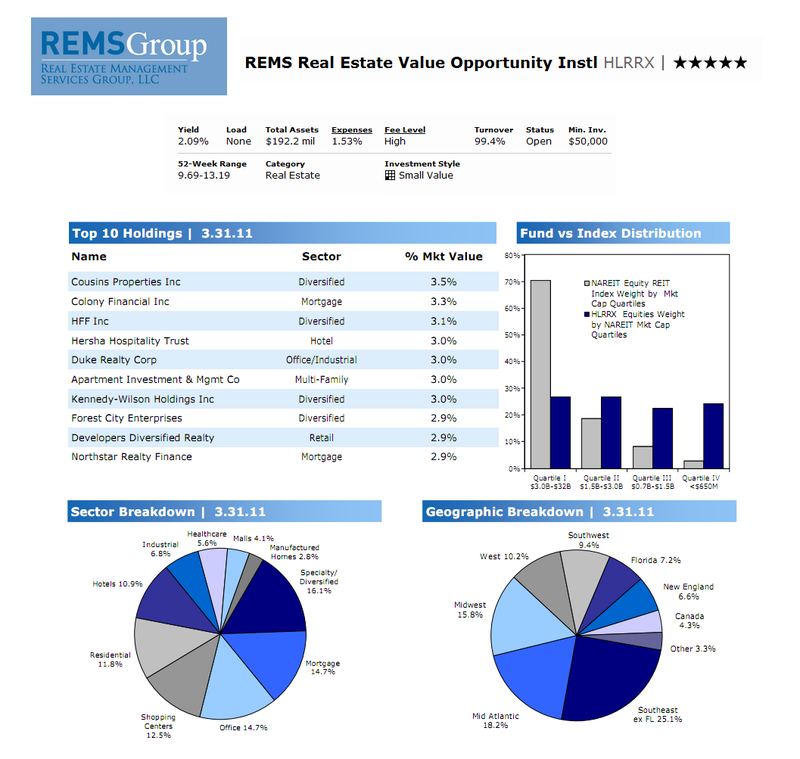 The REMS Real Estate Value Opportunity fund objective is to seek long-term capital growth and current income. The fund typically invests > 80% of net assets, including leverage, in real estate industry companies. This REMS fund does not invest in real estate directly. The portfolio of securities will normally be diversified as to geographic region, property type and tenant. The fund may hold as few as twenty long positions and the Adviser may also take short positions in REITs, real estate operating companies and other real estate securities. It is considered as non-diversified fund. Edward W. Turville is the lead manager of this REIT fund since its inception in December 2002. The fund’s expense ratio is 1.53% per year; this figure is slightly higher than the average in the Real Estate category (1.46%). As part of no load fund, this Real Estate Management Services (REMS) fund doesn’t have any sales load (i.e. front sales load and deferred sales load). The fund also has a dividend yield of 2.09%. The last dividend distributed in June 2011 was $0.04. This REMS Real Estate Value Opportunity fund has 5-stars rating from Morningstar which is the highest rating. This fund has recorded 6 years with positive return with the best 1-year total return in 2009 with 42.66%. The worst performance year occurred in 2008 with -32.38%. It has returned 23.09% over the past one year and 6.69% over the past five years. This top real estate mutual fund has 5.51% YTD return. The other class of this fund is HLPPX. The expense ratio of this HLPPX fund is 1.84%. Investor can invest in this top REIT fund with $50,000 minimum investment balance for regular brokerage account and retirement account (IRA). HLRRX fund can be purchased from 32 brokerages include JP Morgan, Schwab Institutional, Pershing Fund Center, Raymond James, Ameriprise Brokerage, Fidelity Institutional Funds Network, TD Ameritrade Retail, etc. The top 10 holdings of this best fund as of March 2011 are Cousins Properties Inc (3.5%), Colony Financial Inc (3.3%), HFF Inc (3.1%), Hersha Hospitality Trust (3.0%), Duke Realty Corp (3.0%), Aparment Investment & Management Co (3.0%), Kennedy Wilson Holdings Inc (3.0%), Forest City Enterprises (2.9%), Developers Diversified Realty (2.9%) and Northstar Realty Finance (2.9%). The top 6 sectors are Specialty/ Diversified (16.1%), Mortgage (14.7%), Office (14.1%), Shopping Centers (12.5%), Residential (11.8%) and Hotels (10.9%). Investing in this real estate sector equity fund involves investment risks such as: Real Estate market and REIT Risk, Investment in Smaller Companies Risk, Equity Market Risk, Short Sales Risk, Leverage Risk, Non Diversification Risk, and Investment Style Risk.